The tapestry of human history has rarely seen a personality like Sri Krishna – someone who caught the imagination of the philosopher and the poet alike, who enraptured the happy-go-lucky teenager as well as the silent-as-a-still-lake monk, who mesmerised equally the heart of an artist and a down-to-earth worker, who stood as an ideal for a householder and a sanyasi, who demonstrated the pinnacle of true love and the gory nadir of selfish affection, who made people look at Him with awe and admiration together with deep love and warmth in the same breath, He could be the best friend with whom you could let your hair down completely and at the same time be the perfect master to straighten you out strictly, He is the one who gave us the Bhagavad Gita along with enthralling us with the rasa leela. As we celebrate Krishna Janmastami, let us offer our gratitude to this Most Enigmatic and Eternal Being who for our sake donned a scintillating frame again, only so that we can listen to the Bhagavad Gita again, now in a simplified format, and at the same time taste the thrill of true love, which today has become as rare as a river in the dessert. When Krishna came again, the gopas and gopikas must also be around too to create that ethereal magic. One such chosen one is Mr. Krishnadas Eradi from Calicut, Kerala. 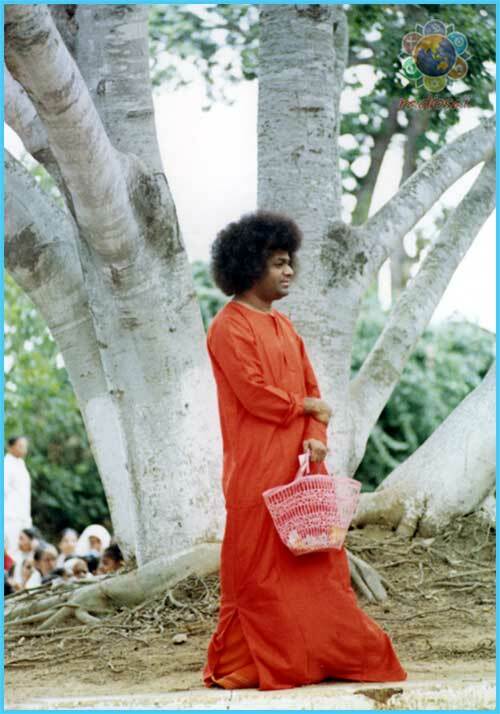 He is among those exceptional devotees of Bhagawan who were handpicked by Him to sport and sing with Him when the Lord Himself was a young adult. Through the experiences the Lord showered on Him, let us revel in His revelations and rich love. It was the early seventies. The Sri Sathya Sai Arts, Science and Commerce College in the Brindavan Ashram in Bengaluru had just begun. 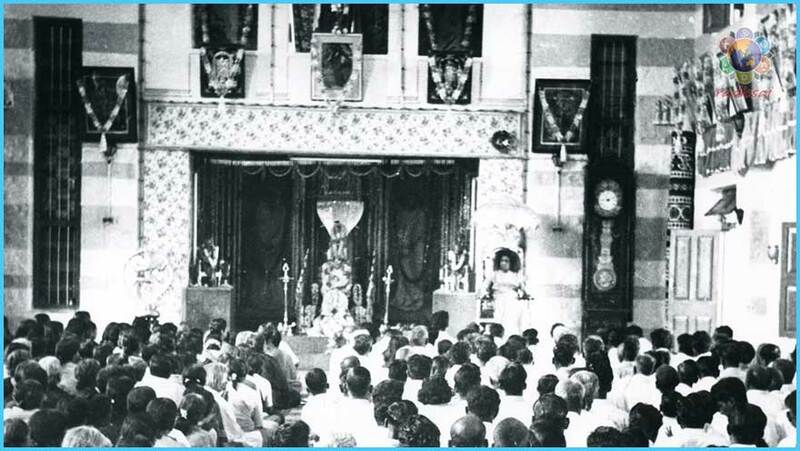 The current Sai Ramesh Hall was in its previous avatar - the charming Sai Ram Shed. The fulcrum of this sacred space on earth was the bewitching statue of Lord Krishna blissfully playing the flute under the sprawling, spacious and ancient banyan tree. When Swami lithely moved around the hungering crowd, no one knew how long He would be there and when He would disappear, whom He would call and who would be put to test, who would be bestowed with a nectarous smile and who would be made to pine more for such ambrosia. Once the college classes were over and the students joined that little concourse, the scene acquired an alluring candour; watching Baba with the boys would transport people into bygone eras described only in scriptures and poetry. Sometimes Swami would be all serious and silent, the next moment He would break into a blooming and joyously mischievous smile; this day He would animatedly narrate stories from the Bhagavad and the next session He would give them a real peak into the past by ‘fetching’ from thin air testimonies of those fantastic tales, be it the Kaustubha jewel of Krishna or the ring of Sathyabhama; one moment He would play a prank and make a student cry, the next second He would fill his heart with so much love that his tears of ecstasy wouldn't just stop. The way the students milled around Swami and lost track of time, food and sleep just to get one more glance, one extra touch, one bonus look, another tiny interaction, yet another chance to just soak in His form even if it was for a split second when He opened the curtain in the morning - it was definitely a replay of the ‘Brindavan of the gopis and gopalas’ set now in a contemporary context. 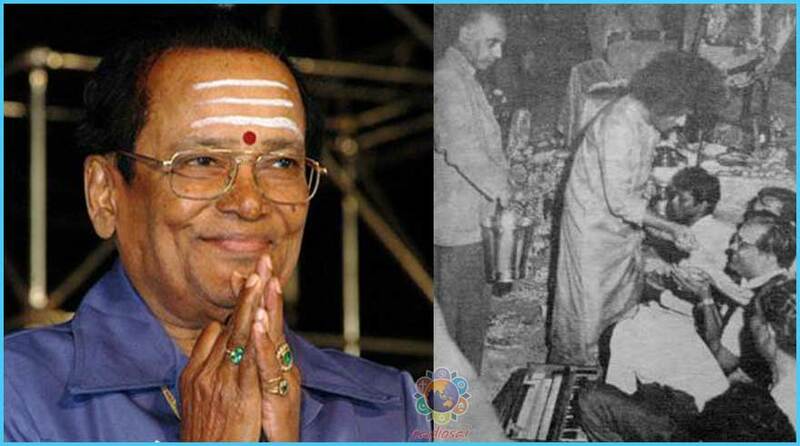 It was during this period that one evening T. M. Soundararajan, the famous playback singer of the Tamil Nadu entertainment industry of the time, came there for darshan. Humble that he was, he innocuously sat in the crowd quite unnoticed by anyone. It was a Sunday. Bhajans that had begun in the morning were on. This was the practice every weekend. 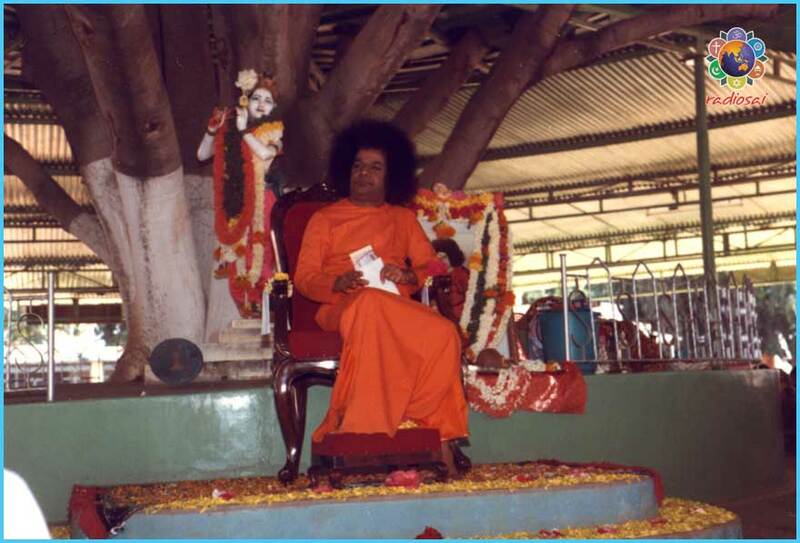 Non-stop bhajans would go on till Bhagawan emerged in the evening, completed darshan rounds and asked for Arathi. That evening too was as beautiful as ever. Swami arrived sauntering along, a smile there, a touch here, a pada namaskaram to the third, a word with the fourth and so on. All bodies and minds were one with His every glance and gesture, act and stance. As Swami gently moved along, He suddenly spotted this legendary artiste and instantly directed him to go to the front and be ready to sing. Mr. Soundararajan obeyed the command. He moved to the first line with such silent gait and élan that barring a few, hardly anyone had any clue of what had transpired. Their gaze was fixed on the Lord and nothing disturbed the elevated state they were in. As their eyes followed Swami, He was now right in front of all of them. The rounds over, He now stood next to that sparkling white and delectable image of His previous incarnation. The Krishna behind Him had His lips on the flute and in the front were soulful strains pouring out from so many hearts. The Lord blissfully swayed as He soaked in their devotion. As those moments progressed, at some point He slowly occupied His chair and now everyone's eyes too sat on His throne. Soundararajan, as directed by Him, was right in front. Swami now looked at him lovingly and through gestures, gently asked him if he was ready to sing. The artiste nodded in affirmation. Swami then looked at the ladies side and indicated the singers to pause. ‘Start!’ Swami indicated to the vocal virtuoso. Immediately his powerful voice jubilantly erupted into a beautiful alaap. Everyone was in awe. Ten seconds into his song and Swami said, ‘Stop!’ He instantly toned down. It was an abrupt end. There was pin drop silence. No one had any clue what went wrong. Completely at sea, Soundararajan stared at Swami searching for an answer. Bhagawan now was in bliss. So were the thousands who were basking in His Love and music that momentous evening - a day the Lord had chosen to part the curtain between Sri Krishna and Sai Krishna. “Mr. Soundararajan had personally narrated this to me,” recalls Mr. Krishnadas Eradi, one of Bhagawan's favourite singers whom Swami personally invited to come and sing in Prasanthi Nilayam way back in the sixties. Every time he takes the mike he brings to the present golden memories of the past. “What to do? We sometimes forget who He is and He has to correct us for our own betterment and growth,” he explains and adds, “Even my journey to Him was similar. My father was a devout person who generously spent a lot of time and resources in organising spiritual discourses by revered saints and holy men every now and then. In fact ten days of every month would go in these satsangs held in our house. We had a huge hall which could accommodate about 300 people. This was in the fifties. Of course later on this is where the Sri Sathya Sai Seva Organisation of Calicut, Kerala, operated from. Most graciously Swami even physically visited this place in 1976 and blessed all of us. “When my father opened it and went through its pages, he just could not put it down. He read it from cover to cover, and now wanted to see Him. So he made plans and we indeed landed in Puttaparthi. It was 1960. The journey from Calicut was extremely arduous to say the least. There were hardly any roads to this village, so our car was of no use. We had to change many buses, get into bullock carts, and finally walk through the Chitravathi sands; it took us nearly three days of bone-breaking journey from Kerala to set our foot here. “Staying in Puttaparthi in those days was as challenging as the journey, or maybe even more. The concept of accommodation itself did not exist. We just spread a cloth and lay down in the Mandir verandah. The sands in front of the mandir served as the darshan area as well as our shelter. We rolled up our beds before darshans began. There were absolutely no facilities of any kind. It was indeed tough for us. We were there only for a day or two. In spite of all these ordeals, something about this place fascinated my father; he loved the discipline here and was immensely attracted to Baba. He definitely wanted to come back. “So we returned to Puttaparthi in a short while. It was in the early sixties. I was twenty-something then. Even though I respected Baba and liked the bhajans here and so on, it was difficult for me to accept Him as God. I grew up singing bhajans on Lord Krishna. He was my favourite deity. I loved Krishna bhajans and we were intimately connected with the famous Guruvayoor Temple in Kerala. So for me Krishna was God and God was Krishna. I relished the stories of Krishna's life and merrily sang Krishna bhajans. "There was not much crowd in those days. 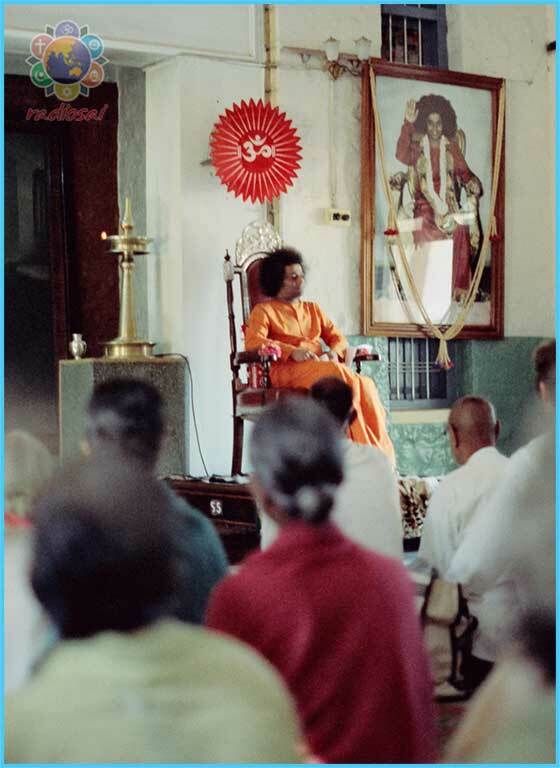 Swami would grant interview to anyone who came to Prasanthi. These sessions would go on from 7 in the morning till 11. After this He would come to the bhajan hall and bhajans would go on for an hour till 12 noon. Mr. Raja Reddy was the only singer leading the bhajans on the gents' side while on the ladies' side was Ms Vijaya. “I remember sitting somewhere behind, one among the hundreds gathered that day. The bhajans started. Soon Baba arrived and ascended the few steps to the throne. Once He was there, bhajans acquired a new charm; He was so involved in the singing that everyone too got into it completely. Baba was in fact directing every hem and flow of the session; He set the pace and the progression of the singing. I liked the compositions, the tempo, the ambience, the voices and the vibrations it generated. "However my mind was on Krishna. I could never think of anyone else as God. That thought came back to me, ‘Is my Krishna there in Baba? Can I see my Krishna in Swami?’ My mind was flooded with these questions. I looked at Baba intently, almost as if searching for my Krishna. And what I saw the next moment completely blew me over! “As I watched Him, the colour of Baba slowly began to change... the orange transformed into blue... His features slowly began to metamorphose... the halo of hair disappeared... a beautiful feather appeared... His enchanting face was glowing in a beatific blue.... what a charming smile! O my God! This is Krishna! This is my Krishna! My heart leapt in bliss. My mind was numb. My body was too thrilled to absorb the enormity of that moment. I wanted to see Him again, and again. Just make that moment eternal. But the next instance it was gone! As if nothing had happened. This is the grand entry that Swami had planned for the legendary bhajan singer Mr. Krishnadas Eradi. Over the years from the sixties, so many singers have come and gone, scores of students have sung in the divine physical presence and moved on, hundreds of artistes have performed in His close proximity and returned with peace and contentment, but Swami kept Mr. Eradi always close to His lotus feet. Even now though he is past seventy his voice booms in the Sai Kulwant Hall uplifting all to the echelons of spiritual bliss that bhajan singing can so effortlessly grant, only if it is rendered by a master of perfection and purity like Mr. Eradi.